The LEGO Series 5 Collectible Minifigures have been released, but not yet in Australia. I’ve bought a complete set of Series 5 minifigs from an eBay LEGO seller from Hong Kong. As you’ve probably gathered from my lack of updates recently, I haven’t had much time for LEGO. I grabbed a spare 20 minutes today to crack open a couple of the Series 5 packets and photograph the minifigs within but the majority are still sitting unopened in a box on my desk. I’ll get there eventually. The first packet I selected at random and opened was the Small Clown. He’s one of the minifigs I was most looking forward to in this series. 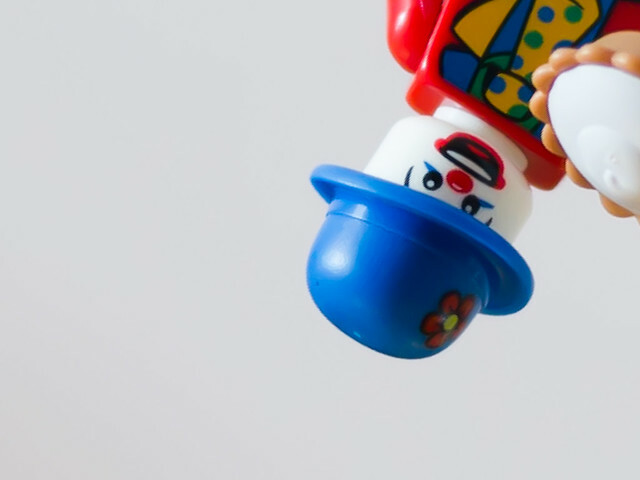 I’m not a fan of the short legged minifigs – don’t like how their legs don’t bend – but I love his little blue bowler hat and his cream pie. He’s got a wonderfully garish coat with green trousers that match the polka dots on his tie. Here’s the Small Clown with the Series 1 Clown. As you can see, Small Clown is a shortie. I have a feeling they’ll be getting up to some shenanigans together soon. I also reckon my Sumo Wrestler would like to eat a bunch of those custard pies. Kyle of Sport Bricks has created a Series 5 Rollout Map. I have just noticed Australia’s got its first map pin. Even New Zealand beat us in getting Series 5 minifigs (now you see why I just went ahead and ordered mine online). If you spot any for sale, consider adding to the map and leaving details on where you saw them, whether they’re still in stock etc. Lately, I’ve been snowed under with work but also kept busy with my food blog. This month, I’ve been taking part in a competition with 12 other bloggers, post weekly reviews about our local Malaysian restaurants, which readers vote for. At the end of the August, all votes across the four weeks’ posts are totaled up and the three bloggers with the most votes will win a foodies’ trip to Malaysia! Obviously, you are under no obligation to do anything, but if you’d like to support me in the competition, feel free to click on the banner in the sidebar on the right to vote for me or check out my latest Malaysian post for the details. If you’ve come across via my TFP blog – apologies for getting the same message again. You know I have to do my best to spread the word! 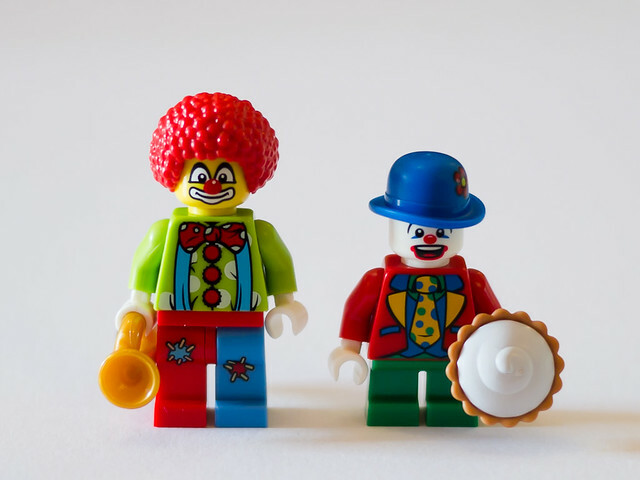 This entry was posted in My latest items, Portrait and tagged clown, series 5 on 21 August, 2011 by The LEGO woman. I live in New Zealand and I thought we got everything late by like 1 or 2 months…….? I have not seen these lego characters before. Maybe they are not available in the US? I am not affiliated with The LEGO Group in any official way. I am just a fan of LEGO. Craig Hind on Merry Christmas!